The image is regular at the center, but the grid pattern is less regular at the peripheral parts of the images (both on the left and right edges). 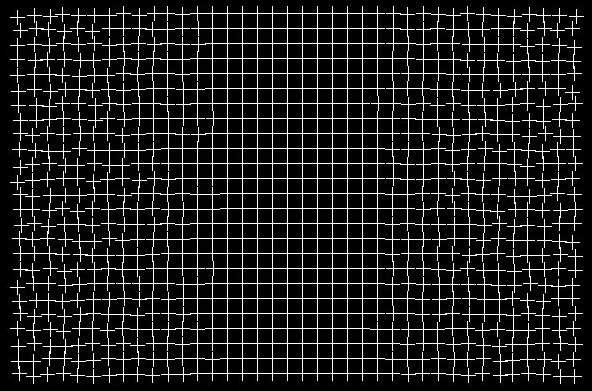 As you stare at the center of the grid for say 20 seconds, the regularity of the grid pattern at the center spreads into the irregular parts in the periphery. This illusion seems to indicate the preference of the visual brain to see regular patterns. An optical illusion happens because the different parts of the eye process images and colors at different speeds, this sometimes means that false images are sent to the brain. The brain receives this information but actually, the eye only sees some visual information at any given time, and our brain processes this and fills in the gaps to give the impression of continuous movement.